Ape Do Good was at 15th Street between Valencia and Mission. 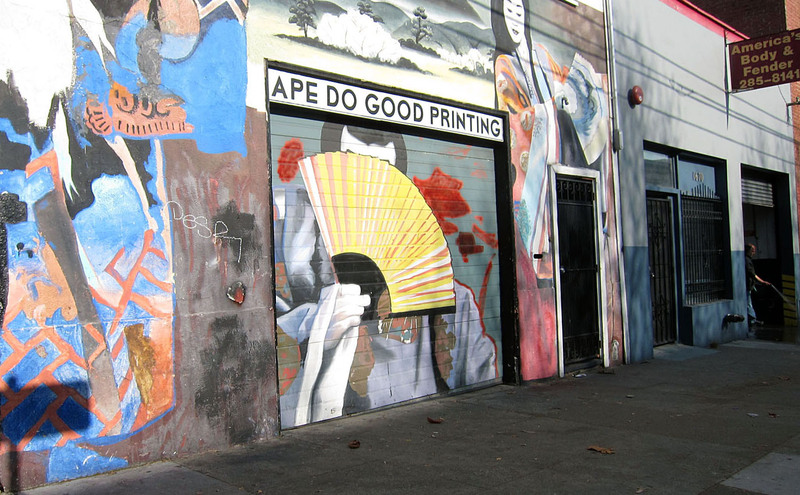 After creating screen-printed goods in the Mission for 16 years, Ape Do Good Printing relocated to the South of Market district in November. Owner Anthony Skirvin started the business in his apartment on Cesar Chavez in 2002. He subsequently settled down at 15th and Valencia for the next 12 years. “Why Ape Do Good moved is that all-too-familiar story of a landlord escalating rent and not offering appropriate lease renewals,” Skirvin said. The renewal offer lacked the “security and commitment of a typical, long commercial lease on a space that wasn’t well-maintained,” he added. Skirvin does not know what will happen to the two-story building he used to work out of. He said the landlord, Robert Dare, had asked him to show the space to a web company from New York City shortly after Skirvin gave notice of the move. It will likely remain a commercial retail space, but no decisions have been made about who the next tenant will be, said Dare. Documenting the Mission’s past and present takes feet on the ground. Support Mission Local today. The 3,500-square-foot space is up for lease at a yearly $29.16 per square foot, according to Loopnet.com, a commercial real estate website. Skirvin said his search for a new space for Ape Do Good Printing was a three-year endeavor. It needed to be accessible and close to BART, accommodating to equipment and employees, and bigger than the 15th Street site so as to allow the business room to grow. Following the move to SoMa, Skirvin has upgraded to “newer, energy-efficient pieces” and some eco-friendly equipment. He also added a showroom that includes artwork from Ape Do Good and featured artists. He said he would miss watching the neighborhood kids walking to school with their parents and people like Dixon, a retired neighbor who would sweep the front of the shop. OrlandoFinal3 from Mission Local on Vimeo. Ape Do Good Screen Printing is now at 7 Grace Street.